Fresh back from representing Hong Kong at the Spartan Team World Championships, Gigi takes us through her Obstacle checklist. When faced with an obstacle, emotions often run high. Taking a step back from the chaos can help you see the obstacle from a greater perspective. "For me, this was remembering why I started. I believe you always perform best when you enjoy something and that was why I started training for my first Spartan. So I knew I had to trust that my mind and my body would not fail me and just have fun and take it all in." An obstacle is not intended to weaken your actions. It is an invitation to get clear on the process to advance to the next stage. "There were a lot of fears going into the race. I’m not strong enough, not fast enough. But this fear for me was a good fear as it kept me focused on training me to be the strongest and fastest I could be. Twisting my ankle a week before the race threw me off course as I felt like I didn’t train enough. But I rested up and trusted my body to do its thing and recover, and it pulled through. It’s important to stay focused and committed but recognise that also can mean knowing when to take a step back. Rest is as important as training." "My running playlist to warm up to and a motivational track from the Nike commercial “welcome to the grind” helps me stay focused pre-race. Then I find a sunny spot somewhere and I welcome the sun into my palms, blessing me for the day." Look at your obstacles objectively as though you are seeing it for the first time. Winners know they are going to face hurdles, obstacles, failures and disasters. "Set on a ski slope, with a freezing swim at the summit, heavier weights and a starting altitude of 6200ft, rising to 8200 ft: I knew this was going to be the toughest race I had faced yet. Not just physically but mentally given the course structure and extreme climate conditions. Warm up started early with temperatures barely above 0 degrees but by the time the course finished it was 22 degrees. We got wet, dried off, only to get wet again. Many had to drop out due to hypothermia. Given the knowledge I had, I made my training program around this." 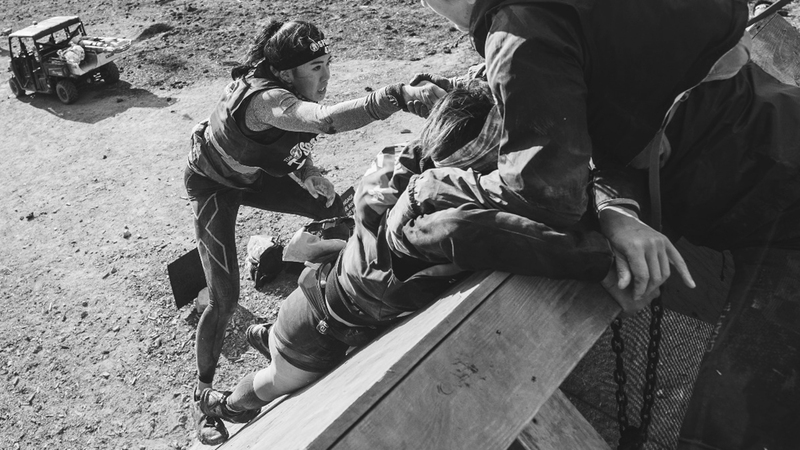 Reach out to those that can help you overcome your obstacle. A fresh pair of eyes or legs and arms, in this case, might be able to see or assist in what you may be missing. "There were two races, solo and team. Dropping the ego was key for success in the team challenge. It was important for me to accept and acknowledge where my weak spots on the course would be and be ok for asking the team to support me. There are certain rules in the team race, honesty and communication are the key ones. We have to play off each other. It worked we finished top out of the female Asian teams and I am so proud of us.